1. Medium gray floor length under dress with long sleeves that are ruched (or gathered) from the elbow to the cuff. 2. 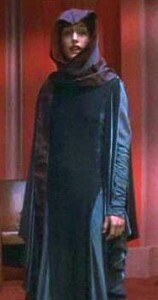 Charcoal gray floor length velvet outer tunic with long, narrow, open, sleeves, and side vents from below the hip to the hem. No panne velvet. 3. Black and maroon cross-dye, iridescent hooded scarf with a maroon or dark berry lining. The scarf becomes long and thin, reaching past the knees and has a maroon tassel on each end. 4. Hair should be pulled back and hidden under the hood. No bangs. Naturally-occurring hair colors only. 5. Low-heeled coordinating tailored pumps or flats.